Taking care of Y O U R family! 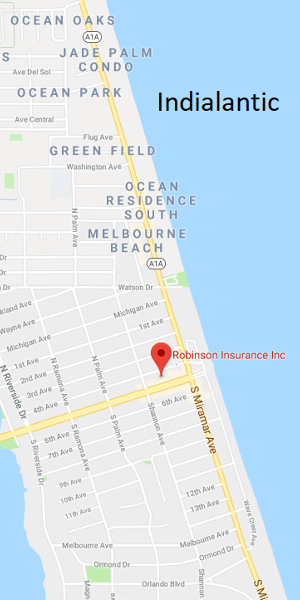 Robinson Insurance was established on Fifth Avenue in Indialantic by the Robinson family back in 1959. Family owned and operated for over 55 years, our office of experienced agents understands the challenges faced by Melbourne insurance consumers. It is essential to have an agent in your corner that takes the time to properly analyze the various options open to you -- both insurance and non-insurance options -- and suggest the best alternatives for you, your family, and your company. Only then are you in a position to make a knowledge-based decision. There's a reason Robinson Insurance has been in business 55+ years. If your home were destroyed today, would it be fully replaced at the correct cost you need? Would your personal belongings be covered snd replaced also? Your home is the prime location of your most important assets, make sure they are covered and protected correctly up to its fullest potential. Just as there's that perfect car out there for each person, we also have that unique and perfect auto policy! Lots of choices. Test drive our best rates today. You will be impressed how quickly Robinson Insurance can get the best rates the first time. If something unexpected happened tomorrow, how would your family and most importantly assets be taken care of? ... or would they? It's never too late to begin implementing a protection plan to protect the assets and possessions that mean the most to you and your family. There are essentially two kinds of heath insurance: Fee-for-Service and Managed Care. Although these plans differ, they both cover an array of medical, surgical and hospital expenses. Most cover prescription drugs and some also offer dental and vision coverage. Robinson Insurance will help best fit your every-day health insurance needs. Robinson Insurance has been family owned and operated for over 55 years! What a rare find this day in age! Our state licensed staff is comprised of President Fred Robinson, his son Shane Robinson, Brianna Stearn, and 7 Robinson Agents we call family. Together, our team has over 150 years combined insurance experience. Come say hello today! The establishment of our agency, with two professional insurance agents, in small office in Indialantic. Move into our current location in the Sand Dollar Office complex on Fifth Avenue. Serving the insurance needs of the community, with our sights set forward.